Spreading Rumors. Greenwich Project. Lao Dong Bei. Feast. Lincoln. In the shadow of the unthinkable in Boston, explosions in West, Texas, avalanches in Colorado and another devastating earthquake in China, my own disaster last week seems minor. 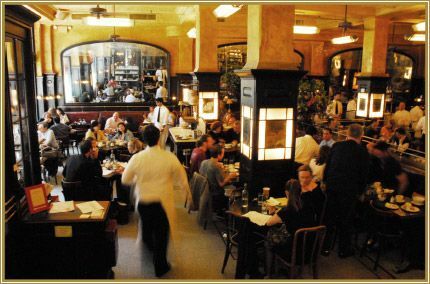 But I was shocked to get an email from Keith McNally questioning my twittering of rumors that my much-loved Balthazar might close. "Say it isn't so Keith," I'd tweeted. Sure enough, he responded. "Where on earth did you come up with this story about Balthazar closing? Did you really want to spread panic amongst my staff? Much easier (and more sensible), surely, to check with me before publishing something untrue." I love that he closed his shout of annoyance with a friendly sign off, "Apart from that, I hope all's well. All The Best, Keith." He was in the new London Balthazar, about to start the dinner service, he noted. 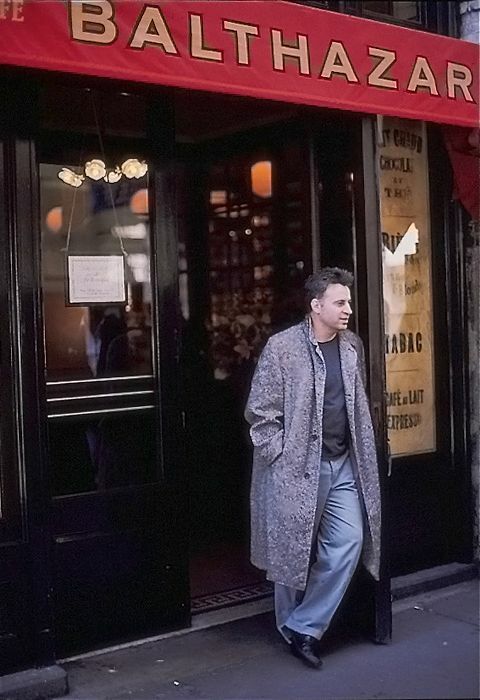 McNally did confirm that Pastis would close next January "for nine months," so that the owners of 9 Ninth Avenue could add three floors. "I'll be moving back around September," he said. So that's it, the rumor and the denial. Twitter is a treacherous swamp. It's not good at all for my morals to have so many followers. They were 162,000 a few minutes ago. Keith promised I'd still be able to get a last minute table at Balthazar or Minetta Tavern. Another weakness I should confess. I call a special number for my favorite table. I usually order the everyday burger and pommes Anna. After my retwittering, Keith even sent love. As those of you who read these lines closely already know. I am especially needy these days. Even long distance love helps. FORK PLAY colors today may have been affected by the dismal grey skies. A friend complains it wasn't clear from last week's blog whether I liked the Greenwich Project or not. 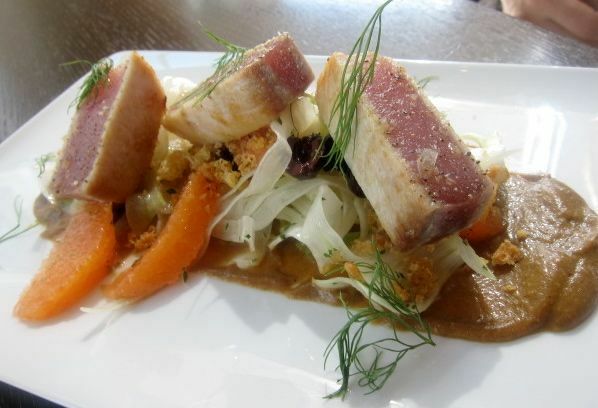 Ridiculous name but impressive chef, I wrote, on the remarkable emergence of the Greenwich whatever on a still partly shuttered stretch of Eighth Street. In emphasizing my doubts about a strip of the West Village once given over to cheap shoes and drugs, I probably didn't say clearly, yes I would go back. I'm actually eager to taste that $88 duck for two. As my friends and I sat sharing a skinny pressed baguette with spicy saucisson and Taleggio, and the fried artichokes daubed with black pepper aioli, we were tortured by the delicious smoke of smoldering herbs on platters of crusty, burnished duck and manhole-size steaks for two. My first impression, seeing the place nearly deserted on a Monday, left me thinking the ambitious prices for the upstairs dining room would soon be revised. Returning the next Friday to what looked like a mosh pit in the bar, a full house eating small plates in the lounge, and a capacity crowd spending big bucks upstairs, was a shock. New Yorkers apparently like discovering something to eat in an unlikely spot. 47 West Eighth Street between Sixth Avenue and Washington Square Park East. 212 253 9335. To read more and decide if you'll join the lemming rush, click here. All of us in our restless sixsome of hot-head eaters are ready to roll two or three times a month - in this case, at the drop of a lamb rib. That's the temptation that brings us to Flushing tonight. Our scout, Rich, the Ethnic Food Junkie, lives in Brooklyn but shops and trolls for edible finds in Flushing. He also has a craving for lamb with cumin. 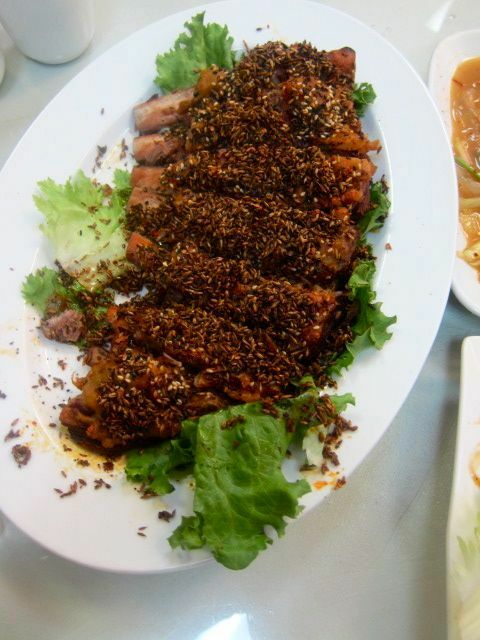 He thinks we'll flip out over the fatty, caramelized cumin-steeped lamb at Lao Dong Bei on a relatively quiet boulevard not far from the malls and temptations of Main Street. Happily, our EthnoJunkie knows enough words in Mandarin (and dozens of other languages), that he will never starve, wherever he wanders. That's useful since the friendly and obliging owners here, Chef An Hong Li and wife Zhu Wen Xia, from Harbin on the border of Outer Mongolia, know almost no English. 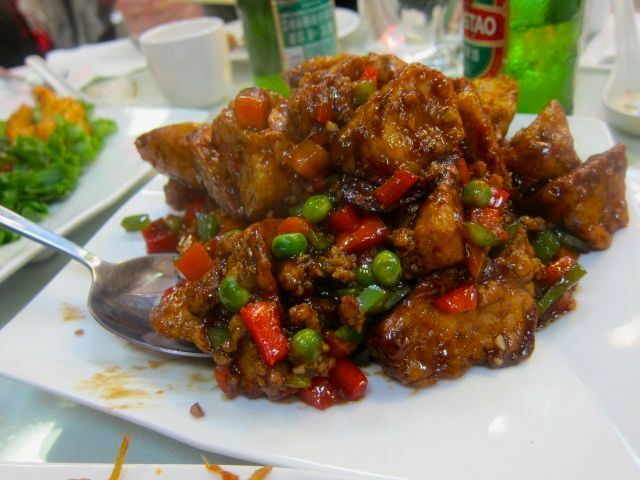 When the Times dropped a couple of forks on Lao Dong Bei in January, bringing curious white ghosts to fill the seven tables in this bright, narrow, almost d�corless storefront, the owners quickly recruited an English-speaking waiter. Still, it will help if you know what dishes we liked. Click here to read more. 44-09 Kissena Boulevard near Cherry Avenue. Flushing, Queens. 718 539 4100. I wanted a downtown kind of spot for friends visiting Manhattan from Brooklyn. (Just kidding. They work in Manhattan and hung around for dinner.) One of my most reliable restaurant-obsessed young friends suggested I try Feast, just opened in March in the East Village. "People seem to be liking it," she said. 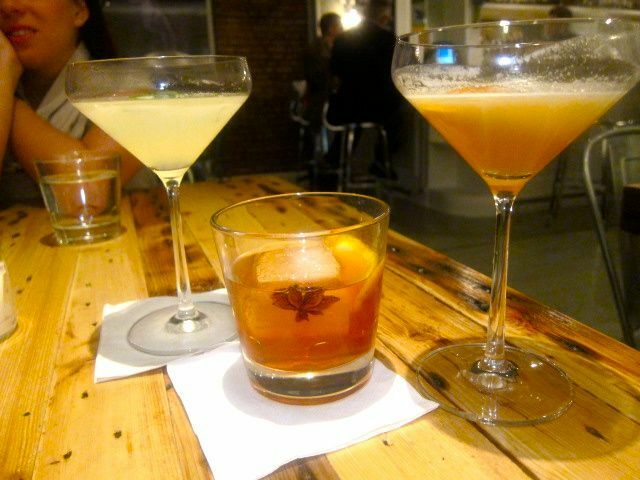 With tastings, no matter the price, a gourmand rage, Chef Chris Meenan and his partner Brian Ghaw conspire to do nine-course feasts at a discount in this narrow raw wood cocoon with a welcoming bar. Empty tonight except for one eater. The four of us must choose among tonight's three feastly options: the $38 farmer's market vegetable celebration, scallops four ways ($52) with vegetable escorts, and nose-to-tail lamb with sides for $48. At first, our waitress insists we must all order the same feast. Impossible, we protest. Pressed, she runs off to check with the kitchen, returning in triumph. Since we are four, we can order two different feasts. "The timing might be off a bit," she warns. All of us want lamb. (Meat! Are you surprised?) Lane, my Glam Media friend sitting opposite me, said "Lamb" first. So Brandon and Gabby at the next table agre to settle for the veggie spin. We agree to divide everything in four anyway. 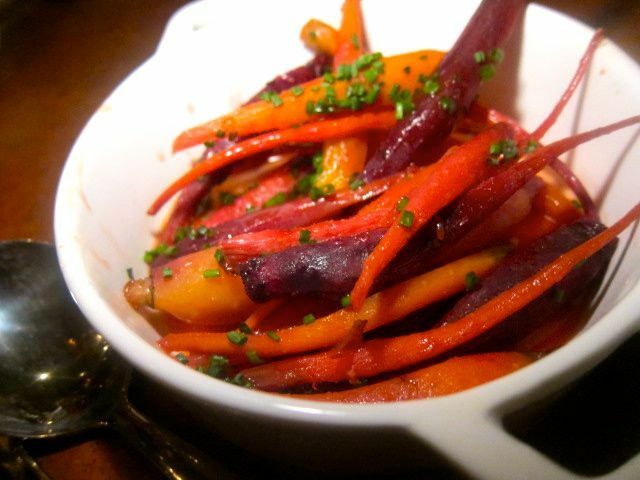 These are not just small plates. Some are tiny plates. The cute little baby vegetable garden comes planted in olive soil in a pair of laboratory vials tucked into a wooden holder. The "Shepherd's Pie" is cubes of meat on two sweet potato rounds. Half a disc for each of us. In the middle of it all, sipping a glass of decent red wine, it struck me as sort of wonderful, fun food. Some portions are quite generous and good. 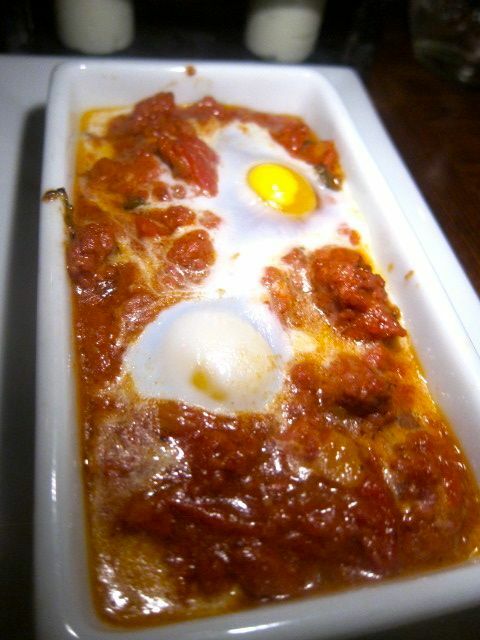 The Merguez stew with tomato and quail egg for one. The stuffed eggplant risotto with slivers of lemon confit. The agnolotti of kabocha squash in brown butter with gingersnap crumble -- our favorite. But, in fact, my critical faculties reemerge and I am forced to acknowledge it's only just okay. "Lasagna," a band-aid of pasta wrapped around some meat and ricotta cheese is decorative, not delicious. Even the lamb rack -- just two chops, simple as that, rare as requested - disappoints. The meat is oddly grainy. 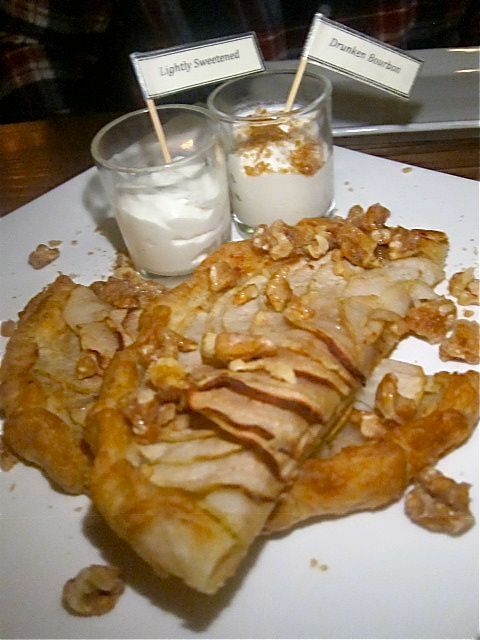 The primitive pastry of the pear galette gets a point for a good splash of booze in the bourbon cream. I admit that eating a fourth of eighteen little portions may not be the path to an ideal experience here. Perhaps that's not fair to Feast. At the end we ponder a dividing wall of glass to the stairwell next door, lights that do not illuminate, the stressed-out budget look. "Isn't Brooklyn full of places that look just like this?" I ask. My friends agree. The difference is Feast does take reservations, if you want to see for yourself. 102 Third Avenue between 12th and 13th Streets. 212 529 8880. I am not on a low-salt diet. I love salt. I have that can't-eat-just-one syndrome with fries, corn chips, popcorn. But clearly I have a salt taste that is definitely more moderated than that of some chefs. When I tweeted about too much salt in the two marvelous pastas my editor and I shared at Lincoln a few weeks ago - I was impressed by how seriously chef Jonathan Benno responded, indeed, that he responded at all. I once sent inedibly oversalted prawns back to the notoriously facile Chef Ryan Skeen, and watched him pick up a handful of salt and toss it into a pot. "We love salt," he responded. But Lincoln's Benno asks me to come back to taste more pasta and to sample his new dishes from Liguria. There I am, twice in one week at lunch. I have eaten so much of the exceptional olive oil-poached tuna "cappanade" sent from the kitchen, as well as my own antipasto -- the rabbit confit salad with bright green olives, favas and cannelloni beans -- that I can only manage one beet brightened pansotto with pine nuts sauce, the second course of my $35 lunch. 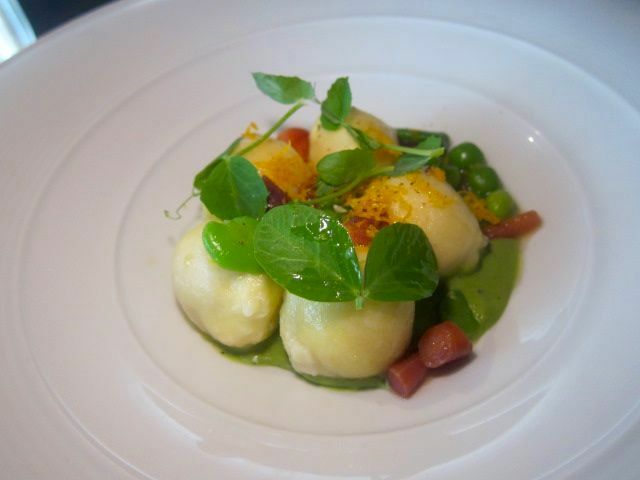 Plus from my host's starter, a plump little ricotta gnudi with English peas and favas. Next day I am back again, lunching with Lincoln's creator, Patina Group boss Nick Valenti (our advertiser as well as a longtime Citymeals board member). He has asked to taste mozzarellas for an event Patina will be catering at Lincoln Center. I offer to forget about ordering and join him. The cheeses come with a remarkable salad, as green as you can get in this early stage of spring. The two of us finish with the tiniest tasting of pastas - just a pair of small dishes. In one, green gigli - a hand-rolled pasta I'd never heard of before - colored green with ramp-top pur�e in the dough, and a sauce of hot sausage, ramp bottoms marinara, sheep's milk ricotta, and Pecorino Romano. I cannot stop eating it, thrilled by the heat, the tart, and the essence of green. A first time encounter with a new pasta. Can you imagine what that means to the mind attached to a mouth as indulged as mine? And actually count that as two pastas I'd never imagined. A pair of Casonsei, half moons filled with braised beet greens, ricotta and egg, are just lightly slicked with butter. Make that flower water-scented butter with poppy seeds, then finished with smoked Parmigiano-Reggiano. Yes, of course, smoked in house. And that is on the menu. Benno strikes me as a man consumed with getting it better and better, even though Lincoln is certifiably wonderful already. 142 West 65th Street. West of Broadway. 212 359 6500. Steven Richter's photograph of Keith McNally, my photographs of cocktails and the carrots at The Greenwich Project, Lao Dong Bei's lamb and the eggplant, Chorizo stew with quail eggs and pear tart at Feast, Ligurian tuna and the gnocchi at Lincoln may not be used without permission from Gael Greene. Copyright 2013. All rights reserved.